With my college generation a new thing developed: “the student movement.” We had a definite effect upon our times. We were in revolt. Not in the manner of many preceding generations…not in the individualistic sense of hating the smugness of middle class life and mores…We believed passionately in the integrity of the human personality, but we sought these ends, not by changing the individual, but by changing the way society—meaning chiefly economic society—was organized. We sought neither wealth nor fame, nor did we expect security and serenity in the end. We had to help change society. We did not feel sorry for ourselves; we felt sorry for the others. The methods would have to be the methods of election and legislation, of large-scale organization, of mass meeting and strike and protest parade. Columbia and London: University of Missouri Press. (originally 1946) 1995. Pages 55-56. 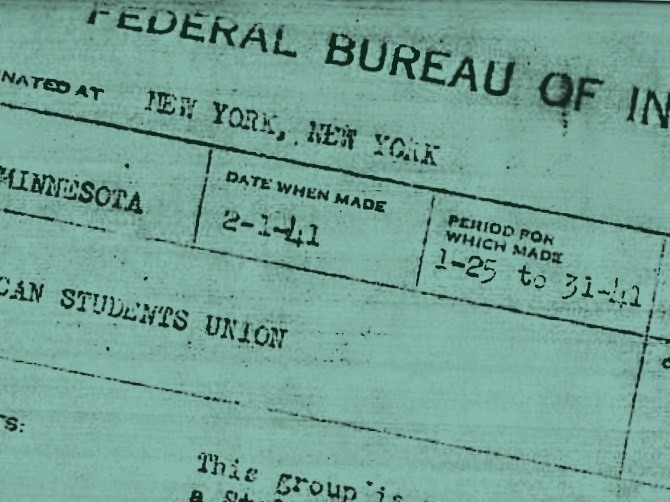 The University of Minnesota student movement, like the national one, opposed the United States entering the war looming in Europe, and requiring male students to prepare for the military as part of their undergraduate studies. By the mid-1930s, white University student activists also began to address issues of racism that had been important to African American students throughout the decade. Student rights loomed large as well. Nowhere did national and state issues meet on the campus more forcefully than in the requirement that male students participate in military drills to prepare the nation for war. Farmer-Labor Governor Floyd B. Olson’s campaign for reelection to Governor turned, in part, on his opposition to required drills, which also affected the choice of eight new members of the Board of Regents in 1935. The American student movement, which focused on international issues even more than domestic ones, opposed the United States entering another war. Beginning in 1934, activists mobilized students across the country in April and November to participate in “Peace Strikes” marking the beginning and end of World War I. Students boycotted classes at 11:30 a.m. for one hour and held the largest campus demonstrations to that point in American history. The strikes continued until 1941. In 1935, for example, 3,000 Minnesota students assembled in the plaza and on the steps in front of Northrop Auditorium for one of the nation’s largest anti-war demonstrations. Fliers were used to both advertise the events and to lay out the positions of the organizers locally and nationally. President Coffman would not allow students to enter the auditorium because he disagreed with their call to miss classes. The demonstration attracted hecklers and pro-war students, who made some effort to disrupt the pro-peace activists, but they were not effective in stopping the peace strike. 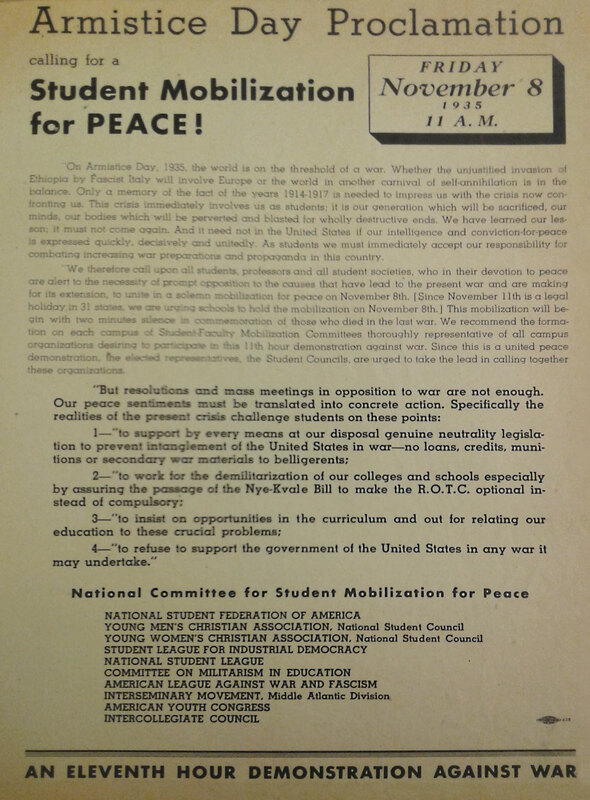 Leaflets calling on students to protest the United States entering a war in Europe were circulated on American campuses, as well as the University of Minnesota. 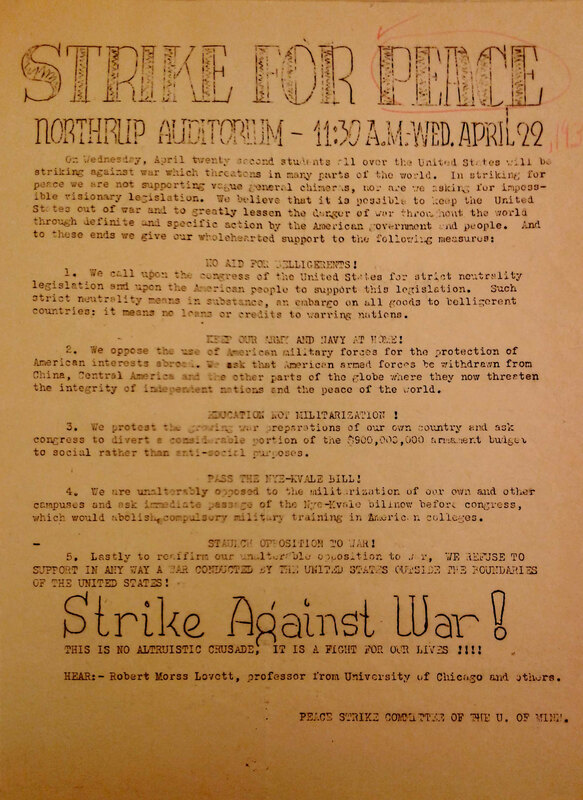 Leaflets calling on students to protest the United States entering a war in Europe were circulated on college campuses throughout the United States, as well as the University of Minnesota. They called for student protests to coincide with dates related to WWI, such as the armistice. The national organizations that supported these protests included the Young Men and Women’s Christian Association as well as political, left-wing organizations. 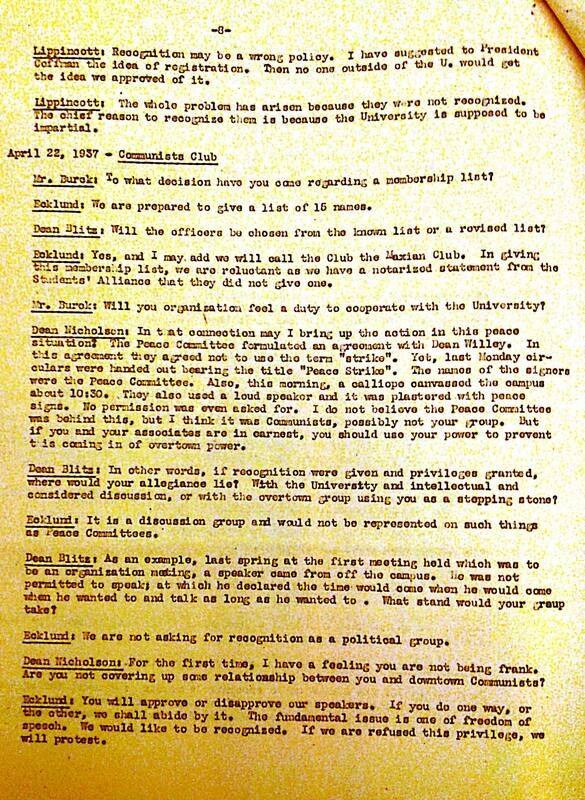 The University administration constantly monitored student activism by collecting names of student protestors, and keeping hand-outs like this one, which was found in the files of President Lotus Coffman. This flyer called on students to skip an hour of class in order to protest the possibility of the United States entering a war in Europe. This flyer called on students to skip one hour of class in order to protest the possibility of the United States entering a war in Europe. This was a national movement in which such strikes were coordinated on campuses throughout the United States. These flyers are in the files of President Coffman because he closely monitored student activism. A few student testimonies from the period reflect on these events. What undergraduate Rosalind Matusow, an activist in the mid 1930s, recalled about the demonstration was Governor Floyd Olson’s speech. She also was impressed by the diversity of opinions among students. “I immediately became involved in student activity, anti-war activity, you know that was the big worry then of all of the students, war and fascism. I remember the first student peace strike. We thought it was just huge because the whole plaza in front of Northrop Auditorium was just filled with students. There was a tremendous amount of work and activity on all kinds of levels. A very few people started it and you know it really developed into a tremendous movement. From the beginning, the Peace Strikes were organized by several different campus groups. They included the YMCA and the YWCA, the Social Problems Club, as well as the All-University Council. 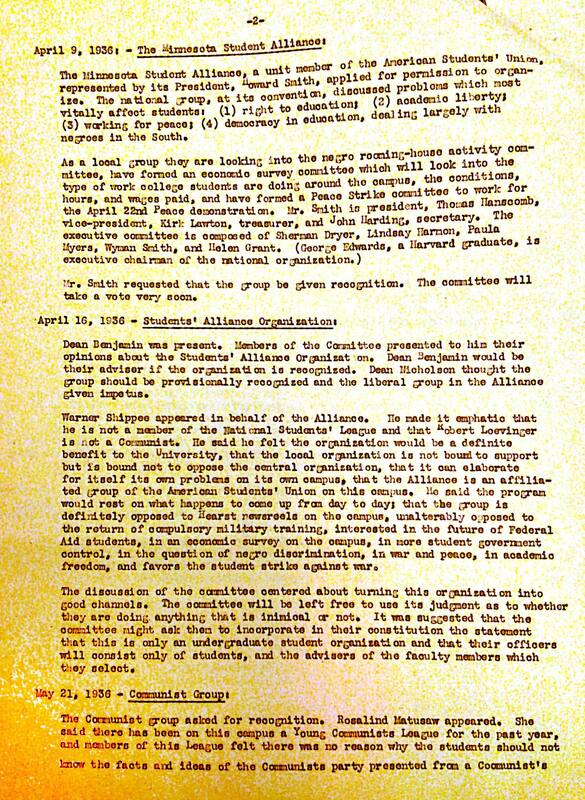 The campus chapter of the National Student League was also an ally, as well as, for a time, the more moderate Practical Pacifists. 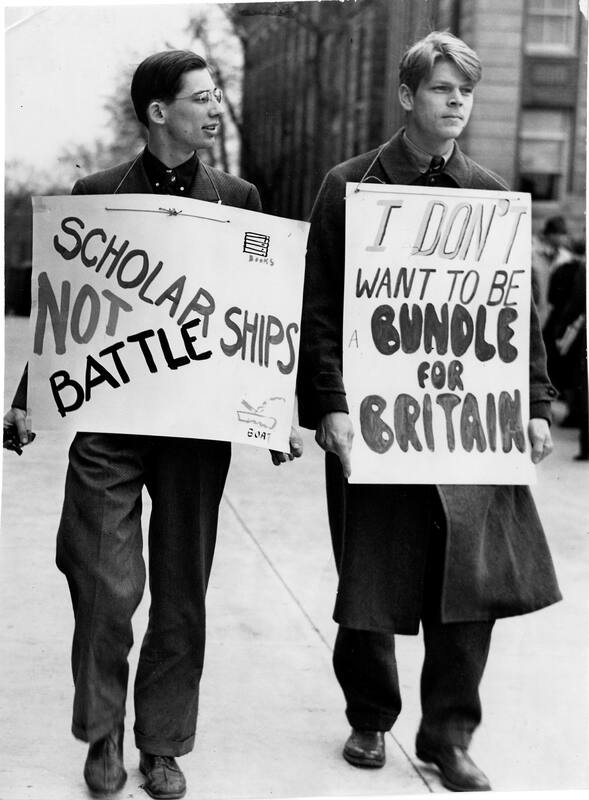 In 1941, University of Minnesota demonstrators carried signs with national anti-war slogans. 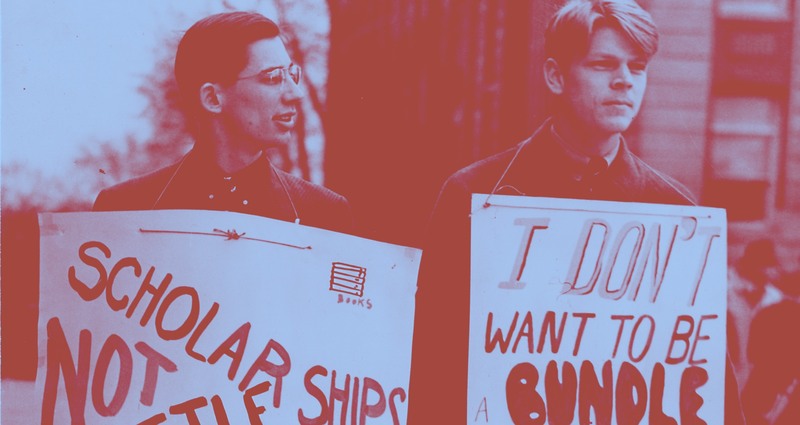 In 1941, University of Minnesota demonstrators carried signs with national anti-war slogans. The student movement was turning toward support for war after 1939 when Hitler invaded multiple countries. Why Did Students Oppose a War Against Fascism? If World War II is remembered as a “good war” because it defeated Nazism and fascism, then why did the vast majority of Americans across the political spectrum oppose entering a second world war, and why students in particular? World War I ended in 1918 and left over 17 million dead; 11 million soldiers perished. Students faced the possibility of war again, barely a decade later. A simple oath, known as the Oxford Pledge, was advanced in 1933 by Oxford University’s debating society in England. It stated, “This House will in no circumstances fight for its King and Country.” The same semester, American students adapted the pledge to state, “I will not support the government of the United States in any war that it might conduct.” Tens of thousands of students took this oath on both sides of the Atlantic. In 1933 anti-war activists at the University of Minnesota held a debate on the Oxford Oath at the University recreation building attended by 300 students. Nearly every male student who attended rose to take the Oxford Oath. Fifty ROTC cadet officers walked out in protest. In 1935, The Literary Digest, a popular weekly that canvassed opinions on a variety of political topics, sought student views on war. Questions included whether students were willing to fight a war outside the United States or within the nation’s borders, and whether industries should profit from building arms. More than 4,000 University of Minnesota students cast ballots, and nearly 90 percent declared that they would not take up arms outside the borders of the United States. Minnesota students were in the mainstream. 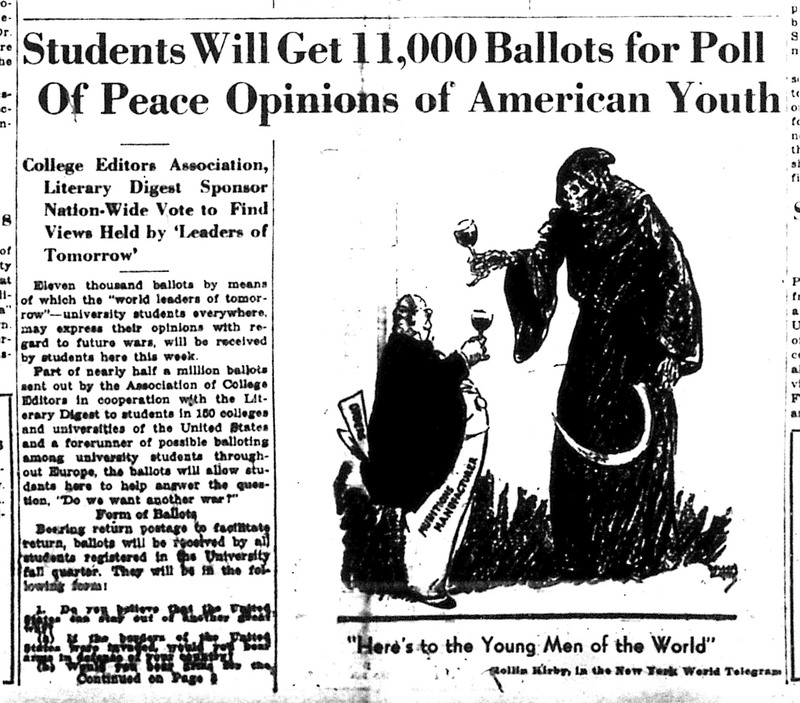 On January 16, 1935, the Minnesota Daily announced the student poll and continued to urge students to participate. This Minnesota Daily article reports that the Association of College Editors will disseminate thousands of ballots so that the “world leaders of tomorrow” can register their opinions in regard to future conflict. The initiative demonstrates the growing anxiety in the 1930s about the prospect of another global war—one in which many university students would no doubt be asked to fight. This reprinted cartoon offers the student peace movement’s perspective; death is in league with those who profited from the war industries. President Woodrow Wilson had promised that World War I would make the world “safe for democracy.” That promise failed, and Europe was now increasingly dominated by dictators and fascism. Activists argued that war could not solve problems. Student activists argued that profits and greed caused World War I. The United States responded to the demands of bankers and the munitions industry and the war made them rich. Students argued that economic gain was the only reason nations went to war, and they rejected nationalism and militarism. Germans were accused of some atrocities during World War I that were ultimately revealed to be fabricated. The war had, in the face of this propaganda, created an atmosphere in the United States of anti-German hysteria that led to the suppression of American civil liberties. Student activists held their families and government morally responsible for this harsh chapter in the nation’s recent history. President Coffman and Dean Nicholson actively worked to undermine the rights of students to assemble, discuss, and debate the war. Coffman would not allow students to enter Northrop Auditorium to assemble for their demonstrations, which is why they were held on the plaza. Governor Olson addressed activists on the steps of the building, below the president’s office window. 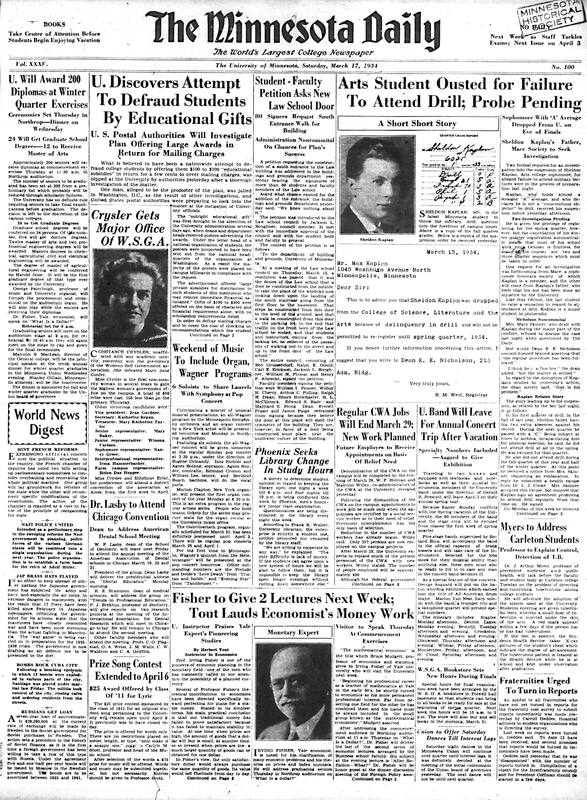 Coffman’s assistant, Dean Malcolm Willey, triumphantly informed him that he was able to minimize the Minnesota Daily’s coverage of these events by speaking to the editor. Malcolm Willey reports to President Coffman that the Minnesota Daily will minimize coverage of peace marches. Malcolm Willey’s letter is an example of the efforts of administrators to shape and influence the content of the Minnesota Daily to their own views. Political surveillance involved monitoring students at demonstrations. Dean Nicholson likely passed names of demonstrators to Ray Chase to build his files of “subversive” students. 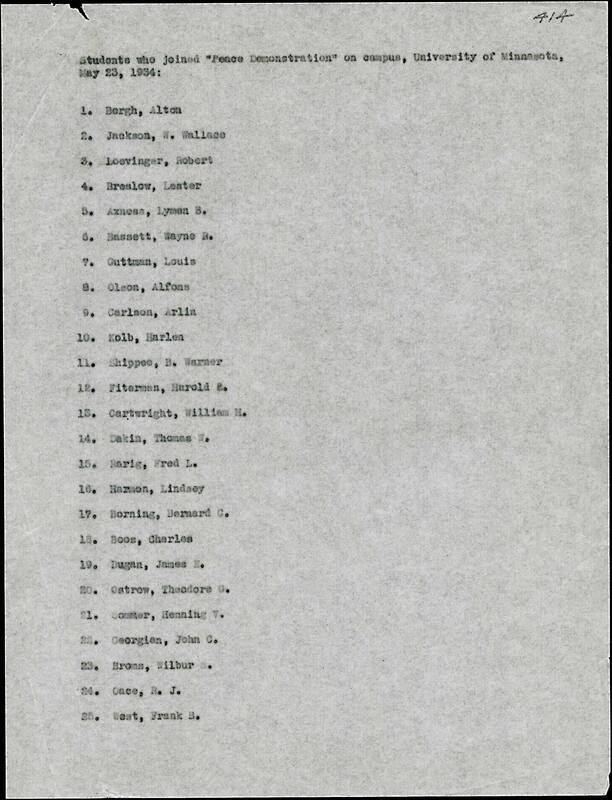 A list of demonstrators from a 1934 student demonstration in the Ray P. Chase files. Campus administrators monitored students who attended peace demonstrations at the University of Minnesota. This list was found in the files of Ray P. Chase. Students were not only spied upon, but then that information was gathered to be sent to Chase. Some of these students appear on Chase’s dossiers on student activists. There seemed to be a law hanging over from Civil War days which made it necessary for any boy striving for education at the people’s university to don a hand-me-down uniform and shoulder a 1905 unfireable Springfield rifle three times a week for a full two years. (It was) a harsh interference with our liberty and a humiliating affront to our personal dignity. Columbia and London: University of Missouri Press. (originally 1946) 1995. Page 59. Public universities required undergraduate male students to participate in military drills and classes in some periods of the 19th and 20th centuries. Male students were obligated to study “military arts,” along with agriculture, science, and mechanic arts, under the Morrill Act of 1862 that established public universities through the sale of federal lands. The University of Minnesota instituted that requirement under the ROTC (Reserve Officer Training Corps) at its founding in 1869 and required young men to prepare for defense of the nation and war. The Minneapolis Star ran this photograph in 1940 to demonstrate preparedness for war. 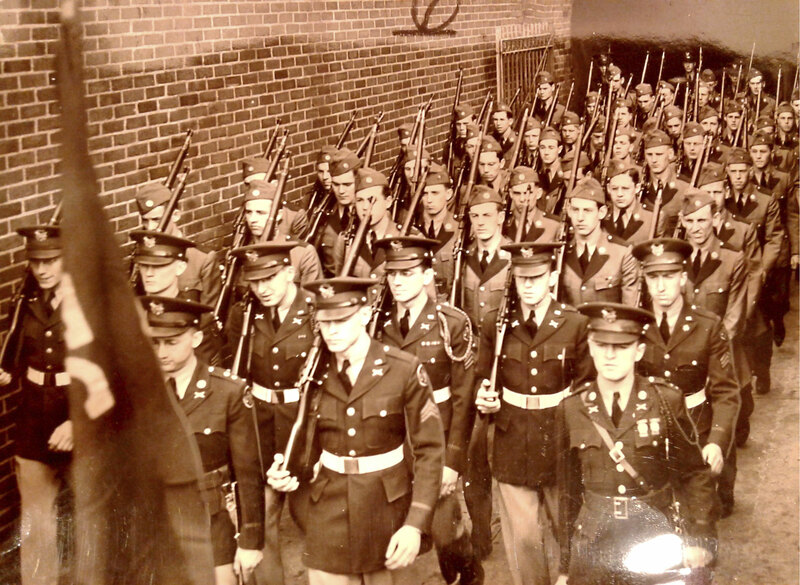 This photograph of the ROTC at the University of Minnesota appeared in the Minneapolis Star to demonstrate preparedness for war. Following World War I, however, students began to question the necessity of required drills, and particularly the place of militarism on American campuses. At the University of Minnesota, student activists built a powerful movement to end required drills, which stretched back to the mid 1920s. The students’ complaints varied. Some declared themselves “Conscientious Objectors,” who were opposed on principle to all wars. Some decried the waste of their time due to the terrible quality and disorganization of the classes. Some objected who were part of the anti-war movement and opposed militarization of the campus and the nation. Warner Shippee sought to legitimize the right of a student to substitute physical education for drills as an act of conscience. Warner Shippee was an activist in the anti-drill movement, and a committed pacifist. He sought to legitimize the right of a student to substitute physical education for drills as an act of conscience. He requested the right to substitute physical education for mandatory drills. President Coffman had the right to decide whether a student could be excused from required military drills because of pacifism. Warner Shippee requested to be excused from mandatory ROTC drills, and to take physical education instead because he considered himself a conscientious objector. His requests first went to Dean Nicholson and then President Coffman. Others had been excused on those grounds. The request came in the midst of student protests over ROTC, which was resolved by the Board of Regents’ decision in June of 1935. An effective campaign to oppose compulsory drills was launched by a new group at the University of Minnesota. These students called themselves the Jacobin Club, and they shared a number of powerful principles, chief among them opposition to war and to required ROTC drill and classes. The Jacobins were a unique fraternity for the 1930s. Their “house” was the student union, and they admitted Jews, which no other fraternity did. Though no African American students were included as members. The Jacobins ranked highest in grade point averages of all fraternities, dominated student government, leadership of the Minnesota Daily, and anti-war activism. Many of them ended up on every list created by Ray Chase of “Radical Students” to be watched. The Jacobins constantly challenged Dean Edward Nicholson, who did everything in his power to control and suppress their effective activism. Kaplan was defended by a Jacobin student activist, Richard Scammon, before the ROTC “military tribunal,” which called for Kaplan’s suspension. President Coffman overrode the tribunal’s decision and Kaplan returned to class. The fight gained momentum. On May 23, the activists scheduled a demonstration against compulsory drill, the same day as the annual spring ROTC review took place. Dean Nicholson attempted to stop the student demonstration, which was written about in the Minnesota Daily. When the students refused to cancel their demonstration the Dean simply censored the newspaper and would not allow it to publish any more information about the protest. He lifted the censorship after two days. This Minnesota Daily cast honors student and philosophy major Sheldon Kaplan’s suspension as proof of how useless military drills and classes were. 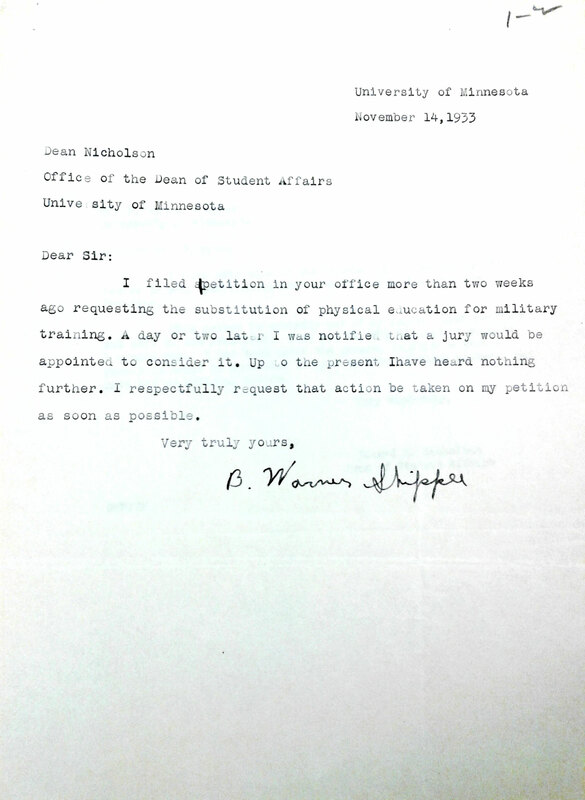 In 1934, Sheldon Kaplan, an arts student at the U of M with a near A-average, was suspended for refusing to attend drill. The controversy would become one of many surrounding the ROTC and the growing anti-drill movement on campus. President Coffman reinstated Kaplan and over ruled the ROTC. The vast majority of the male students who opposed entering the war eventually supported it and fought in it after the United States declared war following the Japanese bombing of Pearl Harbor on December 7, 1941. Did the “lessons learned” from World War I apply to World War II? Why were anti-war activists slow to understand the dangers of fascism, and the genocidal program of Adolph Hitler and National Socialism? The decision to end mandatory drills rested with the Board of Regents. Despite mounting opposition to the drills from students and the Farmer-Labor Party, the Regents voted early in 1934 to maintain the requirement. However, at their June 18, 1934 meeting, the Regents reversed course and voted 6 to 5 to end the requirement and made drills voluntary. Though the issue persisted through 1935, mandatory drills never returned. Military training was therefore made optional, effective beginning with the academic year 1934–35. Student journalists put out a special edition of the Minnesota Daily for graduation, and the next year devoted a page of the Gopher yearbook to their victory. Journalist Arnold (Eric) Sevareid wrote for the Minnesota Daily as a student. His story provides a thorough analysis of the Regents’ vote to end required military drills on campus. This exclusive “extra edition” was written by Arnold Eric Sevareid in June of 1934, when the Minnesota Daily was normally out of print. 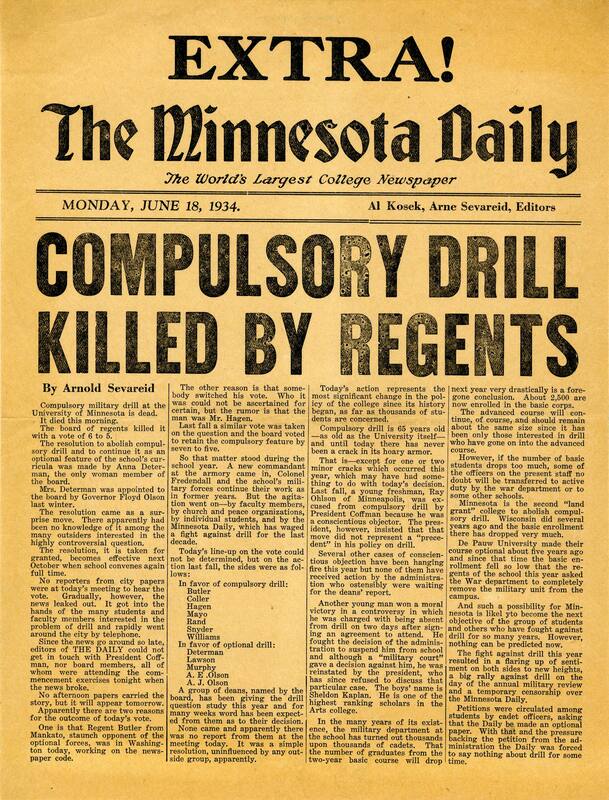 Published and hurriedly circulated among the remaining students on campus, Sevareid‘s “EXTRA!” reported the Regents’ surprise decision to end compulsory military drill at the University of Minnesota, following extensive activism on the part of students. It would be the second land grant institution to do so. 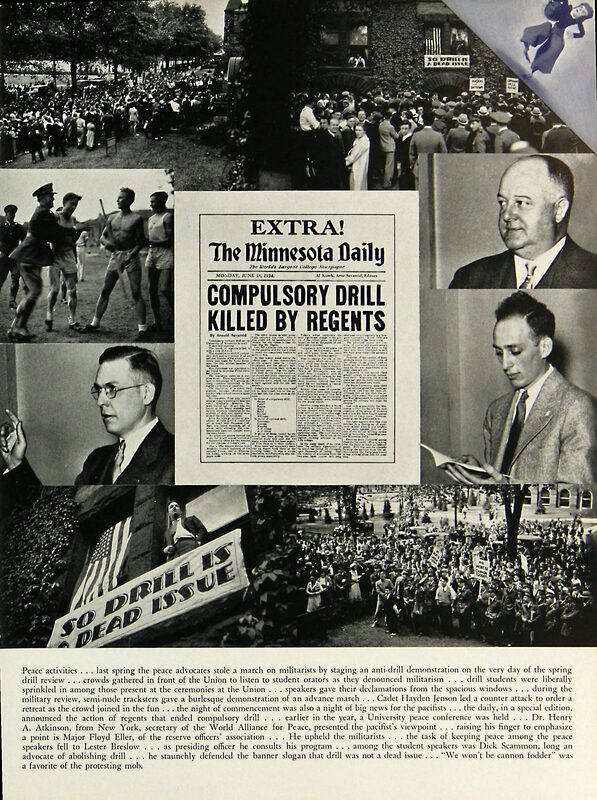 In 1935, the Gopher yearbook devoted a page to the previous year’s battle to end drills. The staff selected photographs of both sides of the debate. American student activists readily grasped that their struggle against war was inseparable from their need for student’s rights on campus. In 1935, they passed a resolution that called for freedom of speech, assembly, and the press. 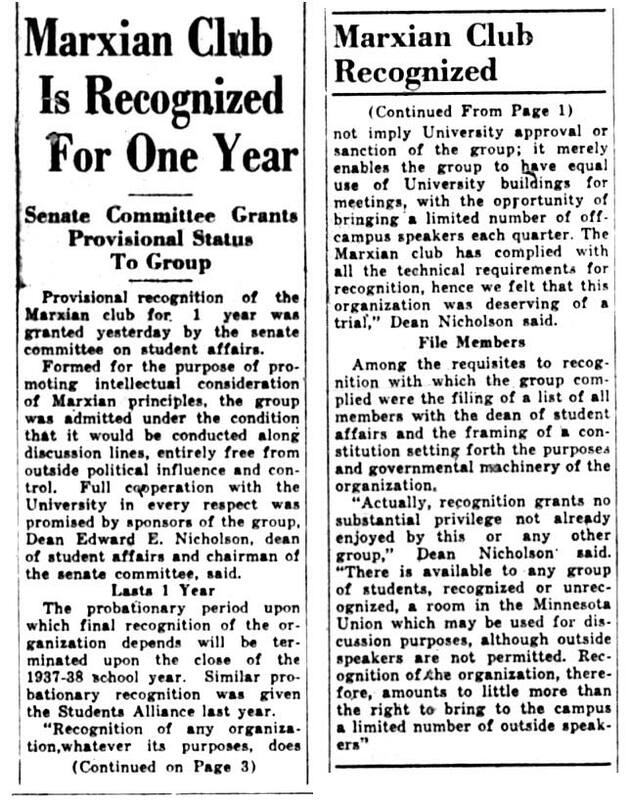 In 1936, the University of Minnesota’s administration and Regents passed multiple rules to further limit or withdraw all of those rights from students. The students’ call for student rights in the 1930s echoed through the student movements of the 1960s and beyond. 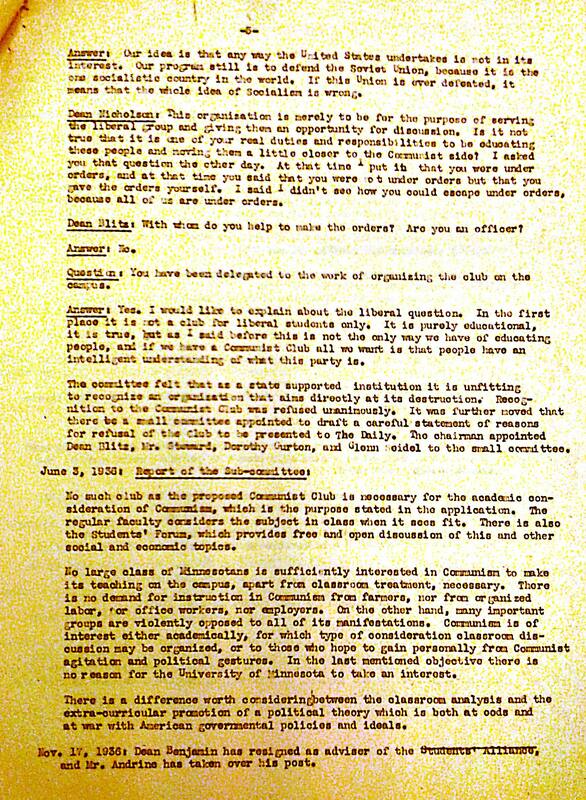 Communist and Marxist clubs were often among the most controversial organizations proposed by students at the University of Minnesota. Their organizers wanted the opportunity to read Karl Marx and other economic thinkers. 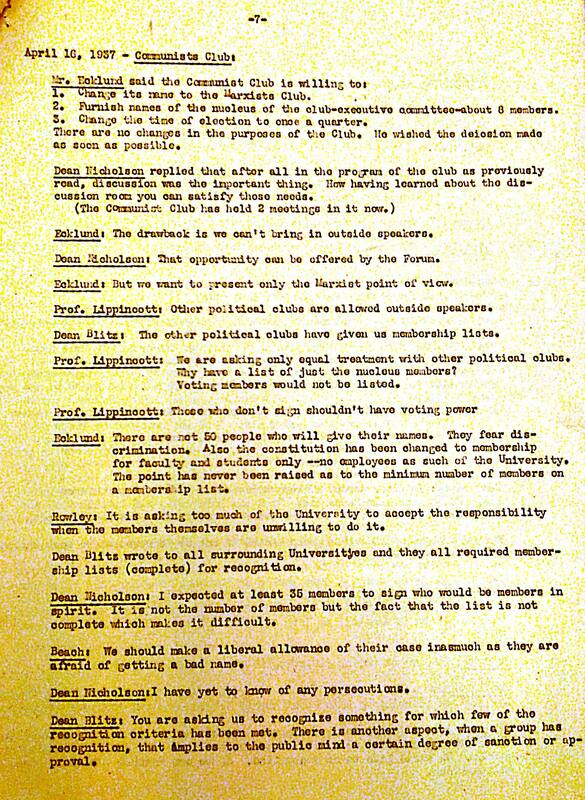 Students required faculty sponsors and had to provide a list of their members, which they feared could be used to punish them for their political views. Five well-known faculty members agreed to sponsor the Marxist Club because of their commitment to students’ rights to free speech and the open exchange of ideas. State Senator J. V. Weber immediately sought to have all of them fired and “sent to Russia” because he labeled them Communists. In 1937, in the midst of an anti-communist Red Scare, Minnesota State Senator J.V. Weber (1892–1946) claimed to have “documentary evidence” of communist activity among faculty at the University of Minnesota. He attacked five distinguished members of the faculty because of their principled support for students to have the right to form organizations for debate and the exchange of ideas, which included a “Communist Club.” Faculty members included William Anderson, Chair of Political Science; Assistant Professor Benjamin Lippincott, Political Science; Joseph B. Ward, English; Herbert Soreson, Education; and Harold Benjamin, Chair Center for Constitution Study. Despite President Coffman’s insistence that there was “no communist activity among the faculty members,” Weber persisted in his resolution to oust faculty associated with the student group. Weber claimed he would provide evidence that these members of the faculty were Communists in the future, though he presented none that could be documented. This Minnesota Daily editorial criticizes the red-baiting tactics of State Senator J.V. Weber, who called for the resignations of faculty members who agreed to serve as sponsors for a “Communist Club” among undergraduate students. The club’s purpose was to study and debate Marxist ideas. This Minnesota Daily editorial criticizes the red-baiting tactics of State Senator J.V. Weber, who called for the resignations of faculty members supporting the formation of a “Communist Club” among undergraduate students. Student organizations required a faculty sponsor and five members of the faculty provided support once they were convinced that the club was independent of outside organizations. The journalist takes issue with the suggestion that the group intended to propagandize, and further rebukes the senator for attempting to infringe their academic freedom. Dean of Student Affairs Edward Nicholson attempted to limit activism by denying students the right to form local chapters of the political organizations that constituted the Student Left. He and other deans interviewed the activists who proposed these groups and demanded to know what their ideas were and to see copies of their membership lists. Most leftist political groups were denied approval. 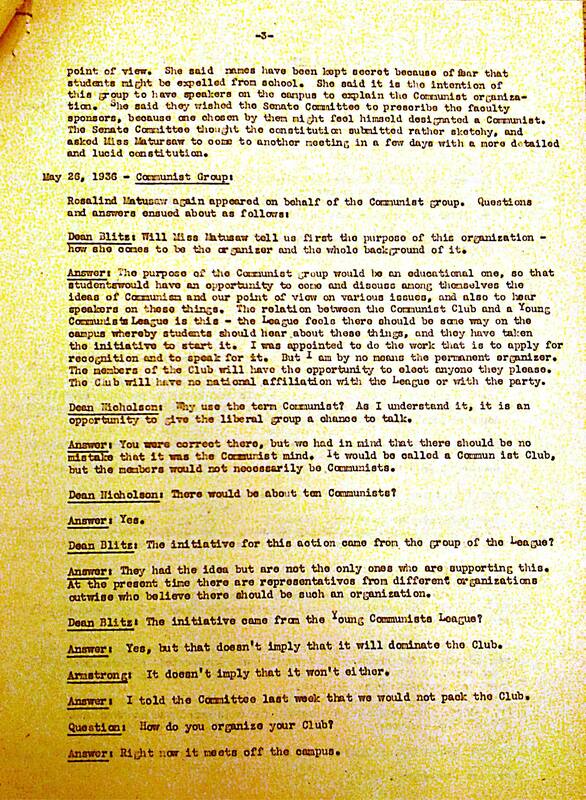 Communist clubs did not want to provide membership lists for fear of reprisals. 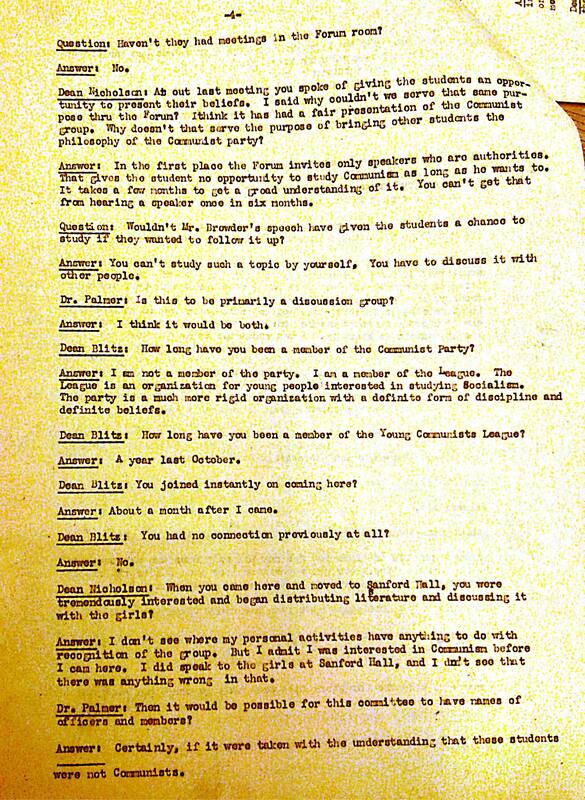 Abstracts of the Senate hearings from 1935 are filled with deans’ accusations about students’ political views. This transcript of a University Senate records how Dean of Student Affairs Edward Nicholson and Dean of Women Anne Blitz grilled students about the organizations they wished to form on the campus. Students were asked about their political affiliations and whether or not they were Communists. Most left-wing groups were rejected. This report was found in the Ray P. Chase papers, most likely given to him by Dean Nicholson. Chase sought access to the inner workings of the University because of his political agenda to portray the University of Minnesota as a “hotbed” of leftist politics. 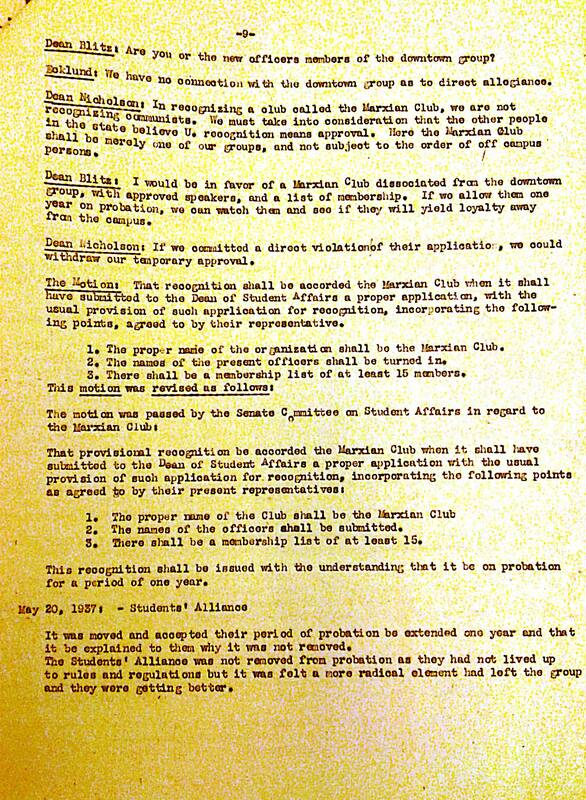 Finally, in 1937, the Marxian Club was given “temporary recognition,” following years of student protests and faculty support. 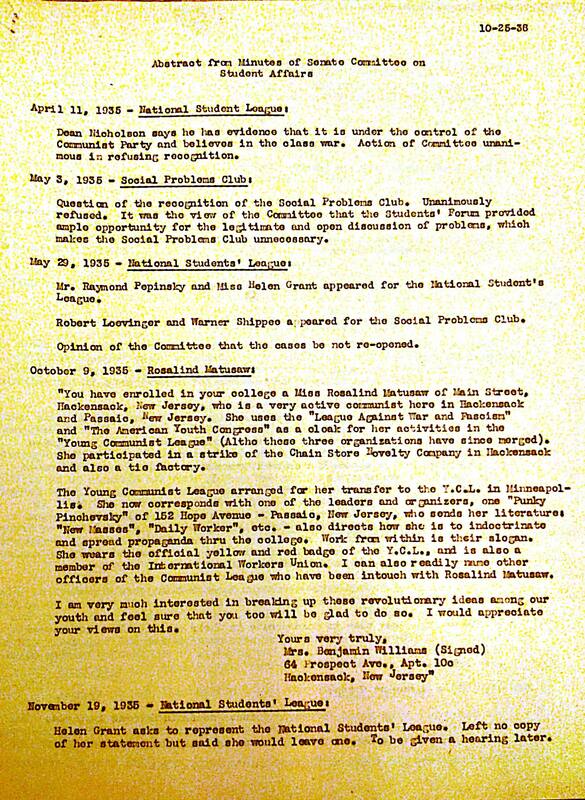 In April 1937, Dean Nicholson agreed to permit temporary recognition of a student group formed “for the purpose of promoting intellectual consideration of Marxian principals” as long as it remained a place of academic discussion and free from outside political control. He continued to send names of student radicals to Ray Chase. In April 1937, Dean Nicholson agreed to permit temporary recognition of a student group formed “for the purpose of promoting intellectual consideration of Marxian principals” as long as it remained a place of academic discussion and free from outside political control. Nicholson also required that the group submit a list of its student membership, which students had feared because of possible retribution. Nicholson authorized this group after organized protests from students and faculty for at least four years, because of their denial of the right to exchange ideas freely. Nicholson continued to pass the names of student radicals to Ray Chase and the FBI. 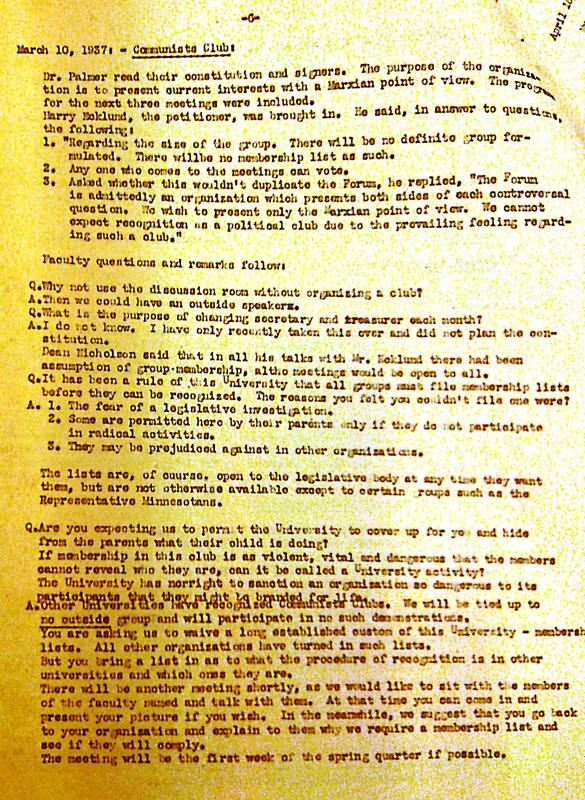 By 1936, the Student Movement had begun to threaten the conservative administrators of the University of Minnesota. Dean Nicholson forbade Mr. Poucher, who oversaw the University’s postal services, to allow first class mail from the Progressive Student Council to be put in student mailboxes. In this and other cases he denied that this information was of interest to students. 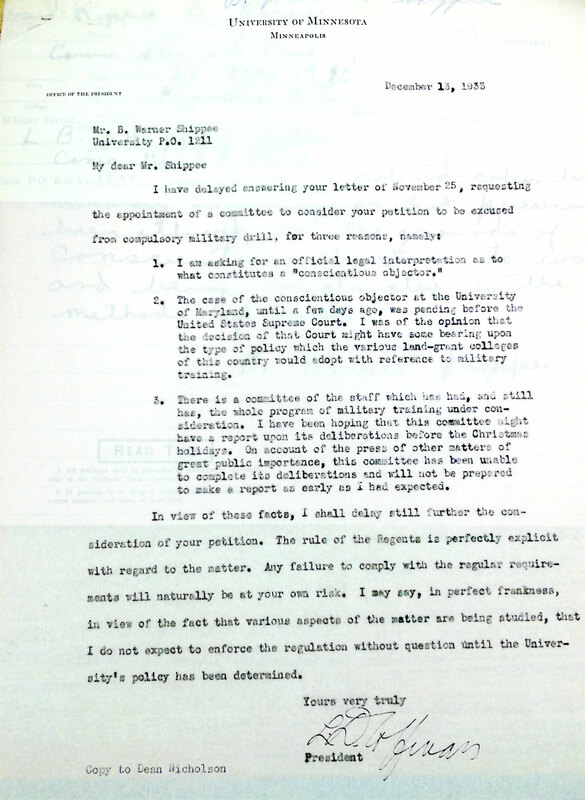 In this 1936 letter, Dean Nicholson reiterated that he blocked mail delivery from the Progressive Council. 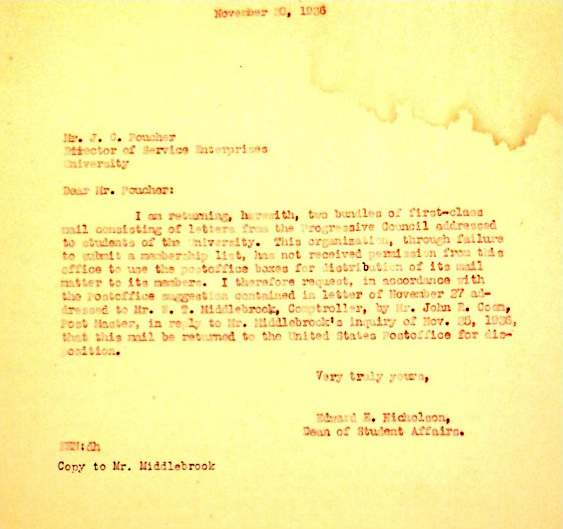 This 1936 letter from Dean Nicholson to Mr. Poucher explains that he would not allow first class mail to be distributed to University of Minnesota students. The mail was sent by a progressive student organization. Dean Nicholson stated that the group was not recognized by the University of Minnesota and could not use the U.S. postal service to deliver mail. This is an example of the ways that Dean Nicholson controlled student rights to distribute political information and to disrupt the United States Postal Service. 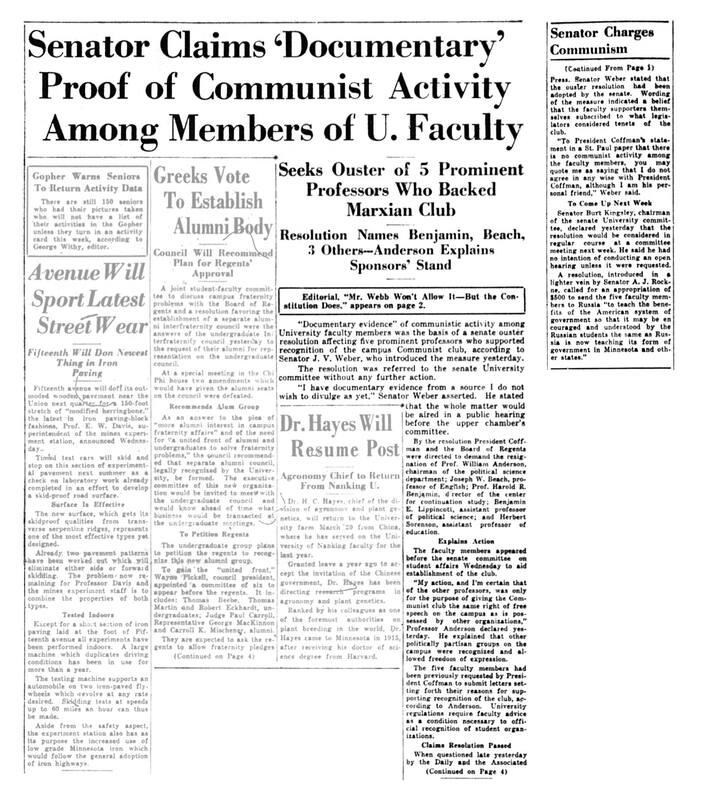 In 1936, the University Senate, directed by Dean Nicholson, put into place severe restrictions concerning the distribution of information that he deemed “propaganda” to students. The University of Minnesota’s administration and Regents passed multiple rules to further limit or withdraw rights from students for the free exchange of ideas. Dean Nicholson would now determine what constituted “propaganda.” Approved information could only be placed on nine bulletin boards on the entire campus. Finally, new policies forbade any group “with partial allegiance to an off-campus group and non-University group” to participate in student government. Description of propaganda rules imposed by the University of Minnesota on student activism. No one ever defined what propaganda was. The University of Minnesota Senate and Board of Regents not only imposed regulations on the public display of student group events and information, but also limited their use of the post office for the circulation of material. 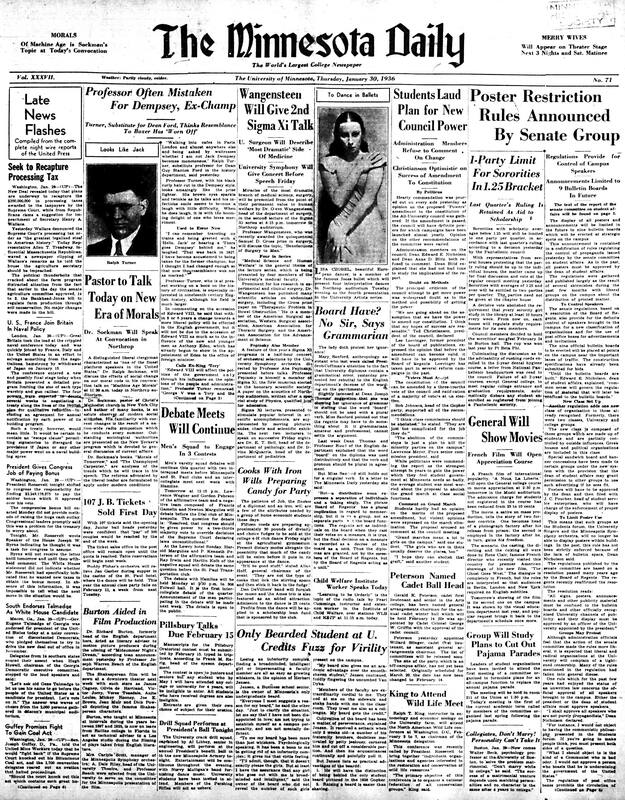 Though they argued that prohibited material was limited to that which was “purely propaganda,” the Regents’ decision was the culmination of ongoing disputes with liberal campus groups. Therefore, many saw the new rules as a backlash against student radicalism. Dean of Students Edward Nicholson constantly advocated for these limitations on student rights to expressing diverse political attitudes. No one ever defined propaganda. The Minnesota Daily explained the rules that Dean of Student Affairs Edward Nicholson finally succeeded in passing to limit student rights to distribute political literature. 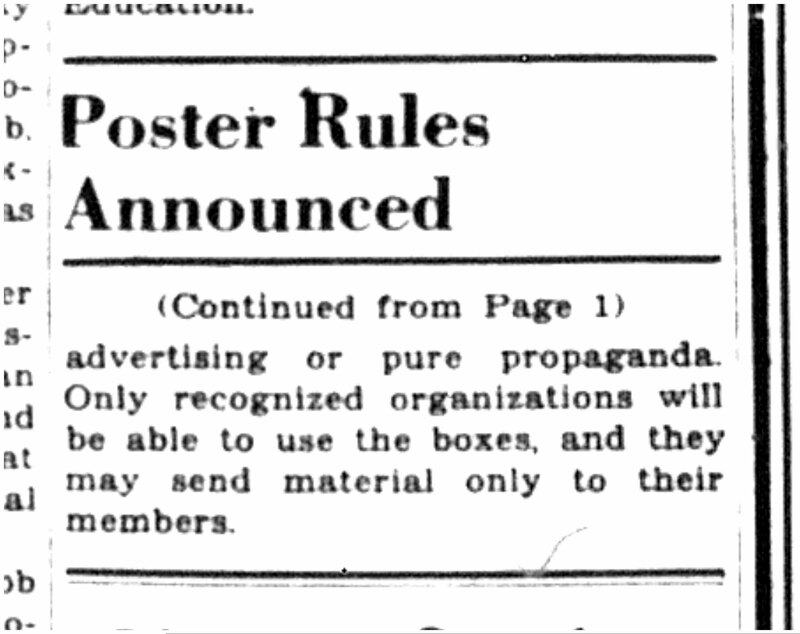 In 1936, the Board of Regents at the University of Minnesota instituted regulations to limit the power of student groups to distribute pamphlets, post “propaganda,” and invite speakers to campus. According to the new rules, all future posters and speaker invitations would need to be approved by Dean Edward Nicholson and enforced by J.C. Poucher, head of student affairs enterprises. The regulations were the result of ongoing “skirmishes” between left-wing groups and the administration, and were interpreted by student activists as an effort to censor political dissent on campus. 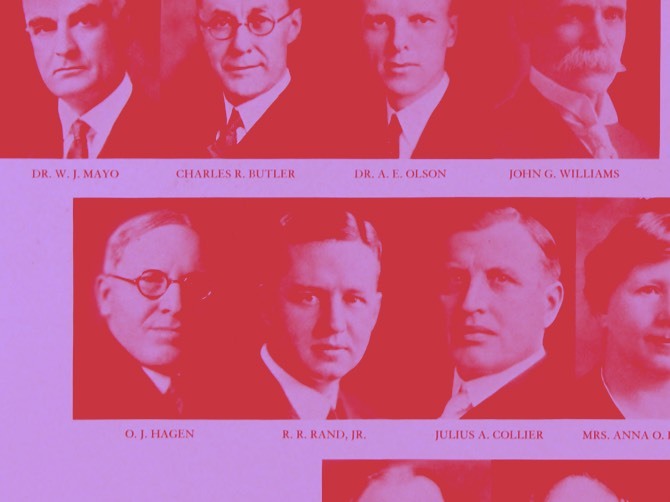 Dean Nicholson worked through the 1930s to contain activism on the left. The Minnesota Daily tracked the events around student rights and reported on the decisions made by the University Senate regarding limitations on student rights to distribute literature and participate in student government. The Daily also editorialized with concern about the decisions taken to limit student rights to distribute political information. The January 30, 1936 edition of the Minnesota Daily summarized the new rules and on the following day editorialized about them with withering sarcasm. 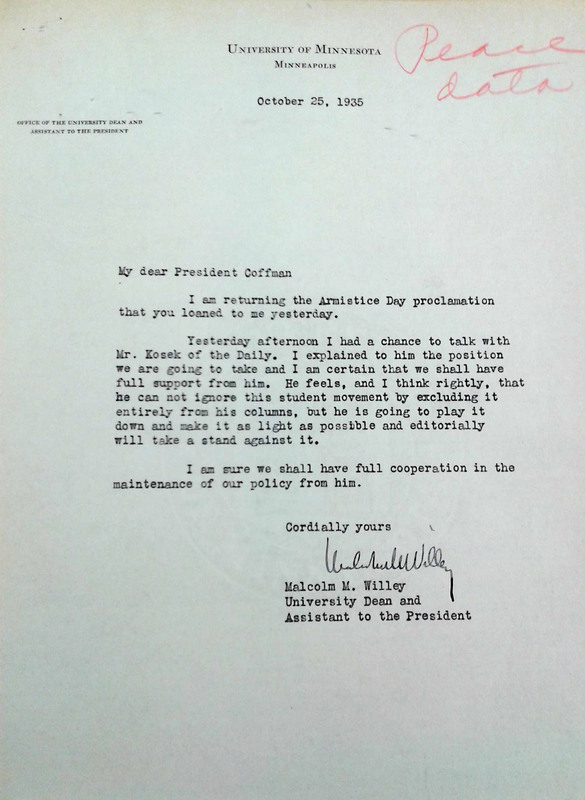 Following Edward Nicholson’s retirement in 1941, no Dean of Student Affairs was ever again allowed to exercise so much control over the lives of students.